NASA has ambitions of using the Orion spacecraft, which was initially meant to return humans to the moon until President Barack Obama axed the project, to land an astronaut on an asteroid by 2019. Officials are touting Orion as America's next generation spacecraft that could first explore the far side of the moon then land humans on asteroids and eventually take them to one of the moons of Mars, where they could control robotic instruments on the surface. But, for now, it has a much more limited role of supporting missions at the International Space Station, just above the Earth's orbit. Designers Lockheed Martin have built a huge test area at its Waterton Canyon site south of Denver, where full-size mock-ups of both the station and Orion can practice manoeuvres. The test version of the pod, though bare of the ceramic covering on the outside, is complete inside. Orion was originally part of President George W. Bush's $100 billion moon mission, called Constellation. But President Obama cancelled Constellation last year, saying the space programme would instead focus on more advanced rocket technology. President Obama revived the Orion portion of the project two months later, with administration officials saying it would be the space station's escape vehicle. NASA is now considering at least two roles for future manned spacecraft, including servicing the space station in low Earth orbit and going on longer, more distant missions. ‘Orion is going to evolve from what it was under the previous Constellation program into what it needs to become as part of the multipurpose crew vehicle,’ NASA spokesman Bob Jacobs said. Orion includes a module for crew and cargo, a service module for propulsion, electrical power and other requirements, and a launch-abort system to carry the capsule to safety if the booster rocket fails. NASA successfully tested the launch-abort system two weeks ago at White Sands Missile Range, New Mexico. Lockheed Martin, Nasa's prime contractor for the Orion project, said it built the $35 million, 41,000-square-foot test facility, called the Space Operations Simulation Center, at company expense. 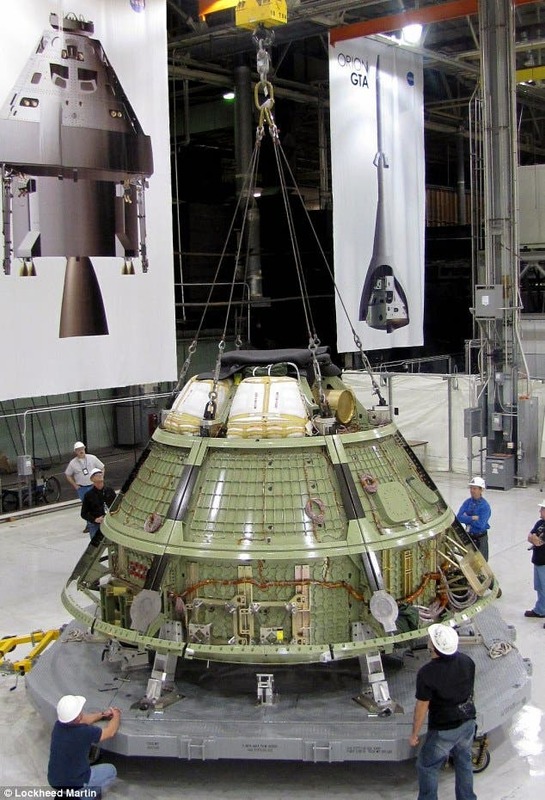 The first Orion capsule is being assembled in another building at Lockheed Martin's Waterton Canyon site. It will be used for ground testing and could possibly be launched into a suborbital test flight, said James Bray, Lockheed's crew and service module director. The Orion craft will be used as a docking vehicle and escape pod. Bray said the test results will be used in the engineering of the first Orion capsule to fly in space. Work on that capsule is expected to start in August. The first orbital space flight of an Orion capsule is expected in 2013, said John Karas, vice president and general manager for human space flight for Lockheed Martin Space Systems Co.